"Sonic the Hedgehog FCBD 2011"
The issue contains only one story Rematch. Eggman has returned and launched his newest creation The Death Egg Mark II!, and is getting higher and higher in the sky. Meanwhile Sonic and Naugus are on the ground as Sonic reflects on recent events and remembers the last time he saw Naugus. It flashbacks to Sonic running through the Southern Tundra as he approaches the ruins of Nate Morgan's Castle slides to a stop to pay his respect to Eddy and his sacrifice with flowers. After placing the flowers the snow below him and he falls a few meters down and he sees a cave full of rings from the fight and Naugus! Sonic tries to attack him but his coat is caught on some rocks alerting Naugus and he freezes Sonic's legs. Sonic asks how Naugus escaped from the Zone Of Silence and Naugus tells him that he had some power leftover and tore a hole back to Mobius and will fuse it with the Zone Of Silence. Sonic won't let this happen and he spins his legs free and starts to attack Naugus while he fights back with a ice ball that follows Sonic. Sonic (with a bit of maneuvering) manages to freeze Naugus but as he's a commander of elements he commands fire which melts the ice. Sonic thinks of using the power rings but realizes that Naugus would do the same and gets hit and buried under rocks which also traps him with the power ring stash. Sonic then transforms into Ultra Sonic and tears a hole back to the Zone Of Silence and Naugus is gone. (In the present) Sonic then tells Naugus that he was right and unfortunately for them both so has Eggman. This comic retcons Naugus Games for issue 15 of the Sonic Super Special Series. If you want to be technical the last time he saw Naugus was in Issue 187. 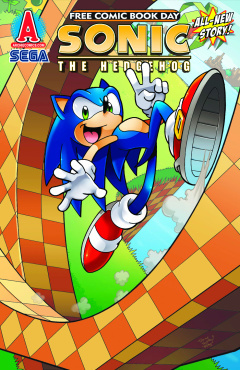 The cover shows Sonic running in Green Hill Zone possibly a foreshadow of the Sonic Genesis Saga. This page was last edited on 31 July 2018, at 03:47.